This article offers a window into the intense training techniques master wedding photographers use to reach the peak of this competitive industry. We always read stories about photographers who do the bare minimum or worse, they do not deliver on their promises. They are not horrible at what they do, but they lost their passion. the love for the craft a long time ago. 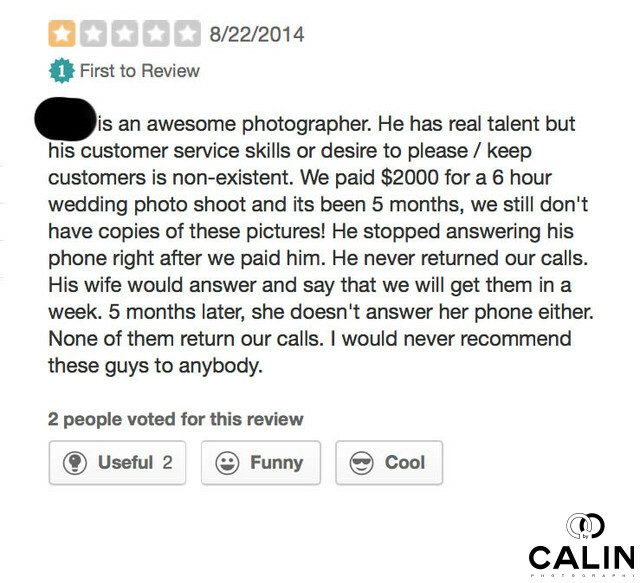 Here is a Yelp review of an talented wedding photographer in Toronto whose business is hurt by his attitude towards couples. You can clearly see that the artist has no desire to please his customers and is just going through the motions. Passion is the most important ingredient to being committed to your work and mastering this craft and standing out even when the odds are against you. I have worked with great second shooters who produced images better than mine on a regular basis. Still, after a few weddings my couples told me they felt that photographer "did not seem to enjoy being there" so we parted ways. After all,the bride and groom hired us to document their special day, not to look bored and check our social media feeds while the couple is on the dance floor giving us great opportunities to capture unique moments. Since when posting a self serving photo on instagram is more important than the father daughter dance? Also, the people you hire are representatives of your brand, so you need to hire only the best. In a Ted Talk "How Great Leaders Inspire Action" (below), Simon Sinek tells the story of the Wright brothers and their competitor Samuel Langley while they were building the first plane. Despite the lack of resources, the Wright brothers overcame all the difficulties because they had an intense love for flight and they secured their place in history. The ones exhibiting a iron discipline gain a solid competitive advantage. In the book Outliers, Malcom Gladwell shows that it takes 10,000 hours to become a master in your arena. Still, just automatically counting the hours is not going to take you there. You need deliberate practice, which involves pushing yourself outside of your comfort zone to reach new heights. One way you can determine if you practice deliberately is to answer yes to the following questions: "am I giving the practice my best?" and "is there a way I can improve?" Taking 100 photos of the rings and shoes every day might be the last thing you want to do, but this practice will make you shine on the wedding day. We love timelines and often want to have the input when it comes to the photo shoot time. That is the reason we have consultations with the bride and groom. We simply want to increase our chances of delivering great results given the circumstances. Circumstances is the key word here. Often you can not control the conditions (makeup and hair are late), the bride ripped a dress, the limo is stuck in traffic, etc. The key to success is to focus on the things you can control and accept that others are beyond our control. A great technique is to write things that can go wrong during the special day and then break them into things we can control and those we can not. By focusing your energy, attention and effort on the aspects you can control and totally ignoring the ones you can not you can increase your chances of success. Also, do not let one mistake ruin the outcome of the whole day. I remember once, at the beginning of my career I photographed a wedding and I totally missed the first kiss. The bride and groom, an older couple kissed for maybe half a second and I missed it. Because of that mistake I could not focus properly and missed many other moments. After talking with some greats of the industry I learned that you only need 700 good photographs and you will always miss shots. There is not need to beat yourself up over something that is in the past. Just analyze the mistake, learn from it and move on. I am a big fan of Jerry Ghionis and during a workshop in Toronto he exuded confidence. Many people thing that confidence comes from winning international photography awards (after all, Jerry won many WPPI, Australian photographer of the year and many other awards). That could be nothing farther from the truth. In fact, during a break Jerry confessed he has a positive attitude and a determination to shoot every wedding like his life depended on it and that gives him confidence. That and the hundreds of special events he documented. Say you botched a photo shoot. If you maintain your positive attitude you will take great photos during the other parts of the day. When you get home, you will draft a plan and be better prepared next time around. A Stanford University study demonstrates how our minds tends to see the results about which we are already thinking. In other words, if we are thinking positive thoughts, we will start noticing positive results and the other way around. This is exactly like when you decide to buy a Tesla and you start noticing that everyone drives one. The phenomenon is a cognitive bias called the frequency illusion. The same applies to optimism: the more positive thoughts you nurture, the better results you will see - that is a virtuous cycle that perpetuates itself to infinity. Best photographers prepare for the worst so they can perform well in case any conditions. One way to be prepare is to increase difficulty. For example, instead of having a one hour photo shoot, have a 5 minute one and try to deliver the same high quality results. According to Parkingson's Law, "work expands so as to fill the time available for its completion." Ask yourself, sure I need one hour for the bride and groom creative session, but if someone put a gun to my head, could I do it in 5 minutes? Most of the time the answer is yes and you could deliver 80% of the results in 20% of the time (according to the 80-20 principle or the Paretto's Law). In psychology that is called the "adversarial growth" or what doesn't kill you makes you stronger and in sports, the same technique is called "overload principle." Sadly, most wedding photographers in Toronto only train when they are paid - on the wedding day. Do you see how ridiculous this is? Can you imagine Michael Jordan training only during the games? Regardless of his talent, his game would be awful without intense training. Most successful entrepreneurs, politicians and athletes recognize that perseverance plays an important role in success - not giving up in front of adversity and continuing with the same passion and intensity. World class wedding photographer Scott Robert Lim said "there is no plan B when it comes to wedding photography." In other words, consider no alternatives and invest all your effort and energy into this to be successful. The difference between ordinary and extraordinary is that little extra. Grit is the "extra" secret ingredient that makes you rise your craft to the next level. When you have an awful day and you don't feel like creating award winning images on the couple's big day, grit is the quality that makes you preform the best you can, makes you give 110%. You will not become the best wedding photographer in the world overnight and if you check the masters' portfolios you will become soon discouraged and give up. As Jerry Ghionis said, today you only need to become slightly better than yesterday and do that every day. Read as much as you can, attend workshops with great artists, try to shadow them on the big day even if you were to shoot for free, improve 1% a day (that will allow you do double your skill and market value in about three months. 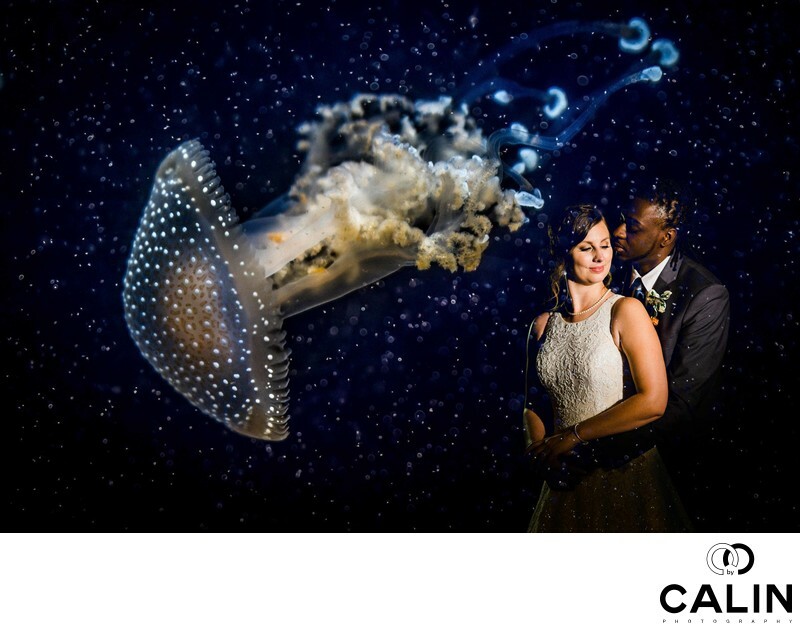 Excellence in wedding photography, like in sports, business politics is not simple, but with the above mentioned techniques you can, over time, if you persevere, become an amazing photographer. I remember the images I took at the beginning of my career and I cringe. Over the years, I learned a thing or two and here are some examples: RedCrest Cardinal Golf Club, Storys Building or Château le Parc wedding. Do I need to work to improve my craft? Absolutely! One day you will might come back to find out I am one of the top wedding photographers in the world.